The meticulous restoration of the classic yacht St Patrick is almost complete. The traditional canvas deck has been laid and the covering boards have been fitted awaiting finishing and coating. Meanwhile, a gleaming array of restored original fittings and newly cast replicas have been nickel plated and are waiting to be fitted to the yacht. Experts in classic yacht restoration, Fairlie have used authentic materials and techniques originally deployed at the William Fife yard in the restoration of the hull. Progress has also been made with Patrick’s spars, with the mast dressed and varnished, and the boom fittings dry-fitted ready for galvanising and final fitting. The last piece of the jigsaw will be put in place in the last week of June as Ratsey & Lapthorn sailmakers of Cowes deliver Patrick’s traditional cut Clipper Canvas sails. In the coming weeks, the team at Fairlie will add the finishing touches to Patrick and will work with Peter Martin of Martins Rigging to fully rig the boat. 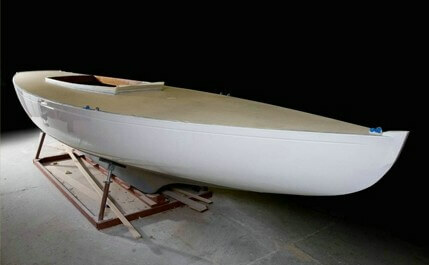 Our next update should see Patrick on the water and undergoing sea-trials. Please follow the links on the right for more information on St Patrick.